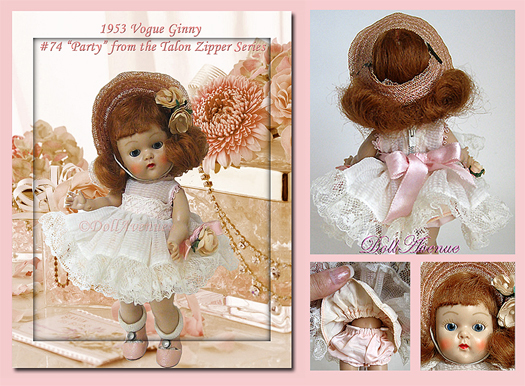 Wonderful vintage 1953 Vogue Ginny "Party" from the Talon Zipper Series #74. This darling carrot-red haired Ginny is in excellent vintage condition. Ginny has sleep eyes that stick, brown painted brows & lighter lashes (no green! ), nicely blushed cheeks (no rubs, though one cheek is shinier than the other)), and ruby red lips. Her bright red mohair wig is soft and full, with the early glued down square bangs. Her body is in good condition with no odors or splits and her arms do hold a pose (though a little loose). She is wearing the 1953 "Party" outfit from the Talon Zipper Series consisting of a pale pink/white nylon lace ruffled dress with satin ribbons and attached peach/pink roses on the sides of the dress. The dress closes with a zipper and a pink ribbon bow in the back. Correct pink satin/taffeta slip with blue Vogue script tag and matching bloomers (elastic still tight), white rayon socks and MINTY pink centersnap shoes with fuzzy bottoms. A wonderful collectible Ginny! *Click the link below to see an enlarged picture.